When trees die in the garden or have to be taken down for other reasons, you should always remove the resulting stump. Otherwise this can cause other problems. 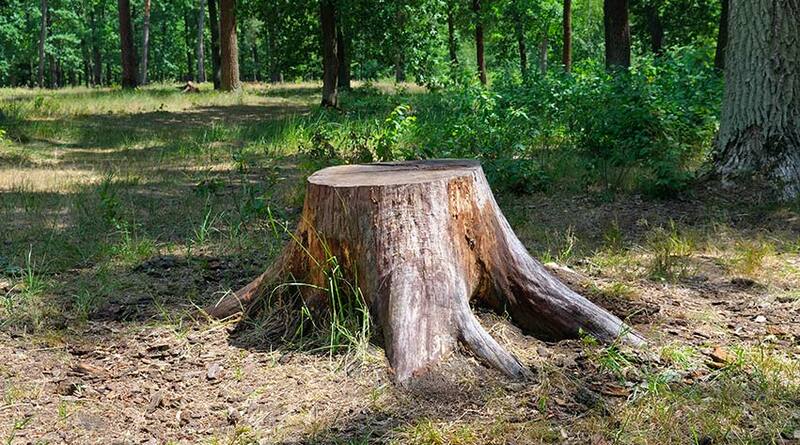 When a tree dies or has to be taken down for other reasons, the temptation is to cut it down close to ground level and then leave the resulting tree stump and its roots in the ground. It’s a lot easier, quicker and cheaper than digging it out! However, it is a much better option to remove the stump, as they can lead to other problems. One problem of leaving behind the stump, is that it can produce suckers – new shoots and stems arising from the still living stump. These can arise several feet away from the stump, and interfere with other parts of the garden. Although a completely dead stump can no longer produce suckers, it can become a host to the difficult to control honey fungus disease. Once in the garden, honey fungus can spread to living plants, which will kill them. As a result, it is far better to remove tree stumps. Stumps can be as low as a couple of centimetres/inches above ground level. Many people think that this will kill the stump and its roots – but it won’t. They can still produce suckers and tree stumps can re-shoot. “Stumps” can be a lot taller, especially when a thick trunk may make the garden owner not bother, thinking it’s too difficult to cut it all the way down. The tree stump is best dealt with at the same time as removing the rest of the tree. If you are using a tree surgeon, arboriculturist or other reputable garden maintenance company or contractor, ask them to remove it at the same time as they’re felling the tree. With small trees or large shrubs, it should be reasonably easy to dig out the stump and most of its major roots. If this isn’t possible, then use a winch to pull it out. These can usually be hired from hire shops – just make sure you are aware of the safety precautions necessary when using one. It may be easier with very large trees or stands of several trees in a large garden to hire a mini-excavator. When physically removing trees in any of these ways, it is far easier to leave at least 90cm-1.2m (3-4ft) of trunk. You can then use this for leverage. If the tree has been cut down to ground level, then a stump grinder is the quickest and easiest way of removing the stump. Again, these powered machines can be hired, but you must be aware of how to use them safely, or you can call in a contractor to do it for you. There are several chemical stump killers available on the market. But bare in mind that they only kill the stumps – they don’t remove them. Depending on size, it can still take several years for the stump to rot away, and can still be subject to honey fungus disease. Most chemical stump killers only work when applied to a live stump, so for best results have to be applied as soon as the tree is cut down. If this wasn’t done immediately, and the stump is less than a few weeks’ old, you can expose living tissue by cutting off the top inch or so of the stump to produce a freshly cut surface. Then apply the stump killer to this. Depending on the manufacturer’s instructions, you may have to drill holes in the stump, or make notches around its circumference with an axe or similar first before applying the stump killer. After applying, cover the top of the stump with a plastic bag or sheet or similar waterproof covering to keep off the rain, and secure it in place. Tree stump killers are best applied in autumn and winter. Don’t leave the stump behind when felling a tree or large shrub. Always deal with it at the same time.